In 2009 artist and writer Sarah Trigg embarked on an ambitious field expedition across the United States, interviewing more than 200 artists in their studios. She’sat down with everyone, from painters to performance artists, to investigate a wide range of artmaking practices. The result is Studio Life, a fascinating photographic and written account of 100 of her most illuminating visits. 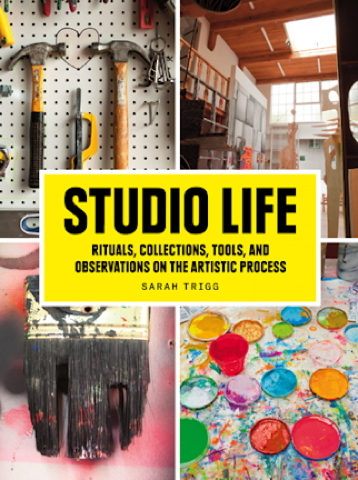 Trigg asks her subjects to share objects and working habits in six categories: mascots, collected objects, rituals, makeshift tools, residue, and habitats. These talismans and behaviors provide a framework for artists to reveal insights into their practices and the nature of the creative life. Intriguing and often humorous anecdotes emerge, of one studio’s mysterious sealed vault, another’s resident bunny, and countless sources of inspiration are unearthed: vintage comics, purses, and kitschy figurines; faded yearbooks and treasured cards and letters; and one handwritten reminder to Quit Feelin Sorry for Yourself. Accessible and relevant for amateur aesthetes and art-world professionals, Studio Life offers an insider’s view of the artistic process as well as a snapshot of the most interesting work being produced today.